Best Buy has put up the Essential PH-1 for sale at a bargain price of $449, $250 down from its launch price tag. The phone may have its issues but there aren't a lot of better devices for that price. The Essential PH-1 was released a few months ago to quite the ruckus, with issues plaguing the phone even before it was launched, effectively setting a path that the Andy Rubin brainchild would follow. The device saw a US$200 price slash about two weeks ago and has seen yet another one, with Best Buy offering the device right now for US$449, a whopping US$250 drop from its launch price. The Essential PH-1 isn't by any means a bad device—it's more of disappointing, really, as issues like its sub-par camera and lack of a headphone jack make it an unattractive prospect to the target demographic it was most likely to appeal to, originally (power users and enthusiasts). In spite of this, however, US$450 for a flagship with near-stock Android, high-end hardware, a premium build, and arguably the best design in the market today is a pretty hard deal to pass up on. At that price point, the only options are Xiaomi's offerings or last-gen flagships. 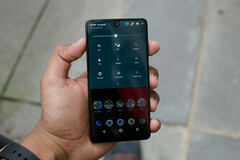 Users are mostly concerned about the company's future, as they believe the PH-1's commercial failure may lead to Essential's demise, which in turn would leave owners of the PH-1 with devices without any chances of getting updates or customer support. It's a possibility, yes, but not one with much chance of happening. Essential are reportedly already working on the PH-2, so it looks like they're here to stay. For now, at least. I'm a freelance copywriter who lives and dies for tech. Android, ​especially. The smartphone market is one going through an impressive growth spurt, so I crawl the Internet with keen interest in a technological ecosystem that doesn't seem to be slowing down anytime soon.